Access to fuel is currently no safe bet. Industry leaders discuss successful hedging strategies in tumultuous times. Even cruise operators with a safe hedging strategy in place have been stung by unanticipated market events, such as the Costa Concordia sinking or Middle Eastern unrest. Figure 1. 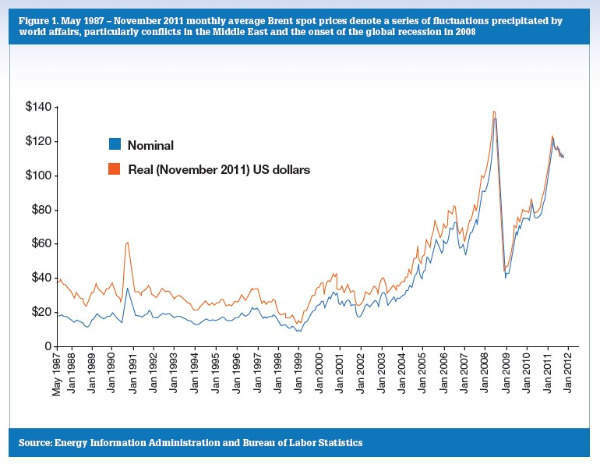 May 1987 – November 2011 monthly average Brent spot prices denote a series of fluctuations precipitated by world affairs, particularly conflicts in the Middle East and the onset of the global recession in 2008. A lot can change in a year. Take Carnival CEO Micky Arison – when interviewed in January 2011 from the floor of the New York Stock Exchange by US satellite and cable business news channel CNBC, he declared bullishly that he had little intention of incorporating a bunker fuel hedging programme, citing cost as the chief deterrent. "All it does is delay the inevitable," said Arison. "It may help your budget this year, but over time, you have to pay the piper and the fetch costs. It’s very expensive." Fast forward 12 months and it is a different story. Carnival’s fourth-quarter earnings report for 2011, released in December, announced profits of $217m, compared with $248m during the same period in 2010, yet among the report’s most conspicuous details was that the group had initiated an extensive fuel derivatives programme, prompting the obvious question – why the volte-face on hedging? The answer comes in the shape of a sharp spike in global oil prices, which have always been at the mercy of world affairs. Similar to the likes of the Iran-Iraq war, the Iraqi invasion of Kuwait and the Lehman Brothers’ bankruptcy that preceded it, the political tumult in the Middle East over the last year has had a marked effect on value, with Brent crude reaching a peak of approximately $125 a barrel in May. Coincidence or not, Carnival promptly saw a sharp drop in stock, with shares hitting a low of $28.63 in August. 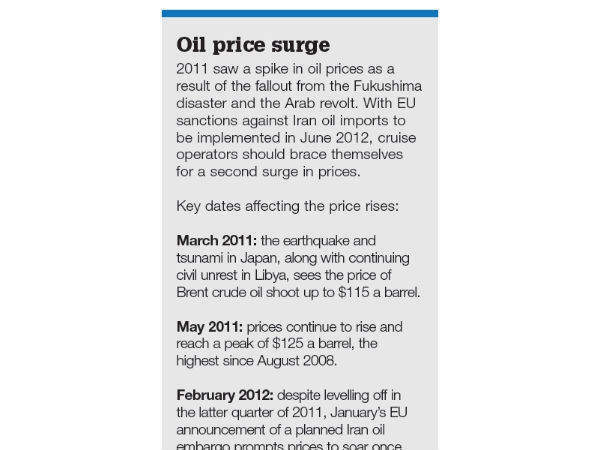 "The political tumult in the Middle East has had a marked effect on value, with Brent crude reaching around $125 a barrel in May 2011. Coincidence or not, Carnival promptly saw a sharp drop in stock." While the latest earning figures reported an annual revenue rise from $3.5bn to $3.7bn, Carnival has clearly pricked its ears to the capriciousness of oil pricing, subsequently announcing in December that it had amassed a net $1m gain on fuel derivatives, accounting for 10% of its energy consumption for 2012. This proved to be a key talking point during the group’s recent earnings conference call. "The programme was intended to mitigate a portion of our economic risk attributable to potentially significant fuel price increases," says Carnival’s senior vice-president and CFO David Bernstein. "As part of this programme, we will evaluate various derivative products and strategies. To date, we have bought zero cost collars for approximately 10% of our estimated fuel consumption for the second half of fiscal 2012 through fiscal 2015, with ceilings ranging $125-135, and floors $71-75." Carnival’s hedging programme also involves the purchase of Brent crude oil call options – at a predetermined price – and the sale of Brent put options, effectively creating both a ceiling and floor for its oil prices. "We designed the fuel derivative programme to maximise operational flexibility by utilising derivative markets with significant trading liquidity," says Bernstein. "These derivatives act as effective economic hedges; however, hedge accounting was not applied. Accordingly, the impact of realised gains and losses on the fuel derivatives that mature each period, as well as changes in unrealised gains and losses resulting from mark-to-market adjustments on our outstanding fuel derivatives, are recorded as a non-operating item in our P&L." While Carnival continues to develop its derivative programme, competitor Royal Caribbean has long made use of a hedging strategy, with CEO Richard Fain being perhaps the industry’s most notable proponent. In February’s earnings conference call with analysts to discuss its fourth-quarter results and outlook for the coming year, CFO Brian J Rice confirmed that, based on current prices, the group has $224m of fuel expenses for the coming quarter and a total of $889m for the entire year. "It is not so much a case of pre-empting market fluctuations, but rather that operators should hedge continuously, even when fuel appears to be at its most abundant." So, what do operators need to take into consideration in order to successfully manage fuel price risks? Speaking to Michael McNamara, assistant vice-president of global fuel supplies at Royal Caribbean, it is not so much a case of pre-empting market fluctuations, but rather that operators should hedge continuously, even when fuel appears to be at its most abundant. "Our strategy is not to speculate on market movements," he says. "We do not attempt to either beat or time the markets with our strategies. Instead, we try and maintain a disciplined approach to reducing fuel price risk over time. We typically start hedging our fuel exposure three to four years out." While McNamara concedes that 2011’s Arab Spring, which coincided with the earthquake and tsunami in Japan "had an impact on ticket revenue and fuel expense", Royal Caribbean was able to offset the effects through having 58% of its fuel demand already protected. This was done mainly through the use of fixed-price swaps and forward purchasing from suppliers. "The first big factor that needs to be managed is precision in demand planning," says McNamara. 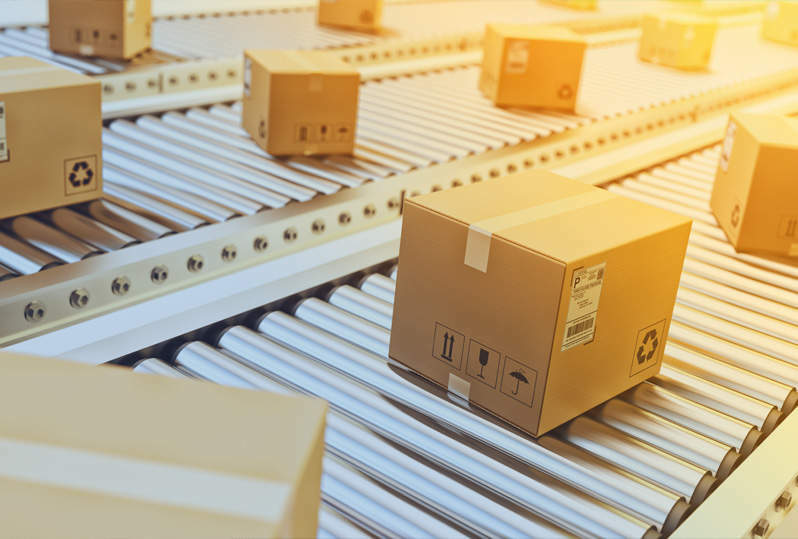 "There are also additional logistical constraints that need to be considered, including the reliability of the supplier. Operators need to ask themselves if the supplier will be able to beat the prices that could be achieved in the derivatives market." To assist its in-house hedging team, Royal Caribbean also keeps its ear to the ground for potential pricing fluctuations by using external risk-management experts. "We sometimes use outside consultants on a limited basis to help validate our policy and strategies," says McNamara. "It’s important to remain engaged with the key players in the physical and financial markets in order to stay informed on critical developments." Another factor set to have a knock-on effect on future hedging strategies is the International Maritime Organization’s pledge to reduce the levels of sulphur found in fuels from 4.5% to 0.5% by 2020. "Another factor set to have a knock-on effect on future hedging strategies is the IMO’s pledge to reduce the levels of sulphur found in fuels from 4.5% to 0.5% by 2020." Bearing in mind that bunker fuel is around 60% cheaper than the greener equivalent proposed, McNamara admits "there is real potential for a significant rise in fuel costs"; however, there are more immediate concerns on the horizon for operators. Only a week after the Costa Concordia accident off the western coast of Italy, January 2012 also saw the announcement that the EU would impose an embargo on Iranian oil supplies, set to commence in June. The ramifications of the statement were felt almost instantaneously by operators, both in Europe and the US; at the time of writing, the price of Brent crude oil sits at approximately $120 a barrel, the highest since mid-June 2011 and denoting a rise of 20% since the turn of the year. "I can’t speak for the entire industry, but we are seeing more operators pay greater attention to the benefits of a hedging strategy," says McNamara. "For ourselves at Royal Caribbean, we hedged 50% of our 2011 demand prior to the recent Iran concerns. We believe we have adequate protection from various potential price or supply shocks." Given recent events, never has fuel hedging appeared more prevalent. 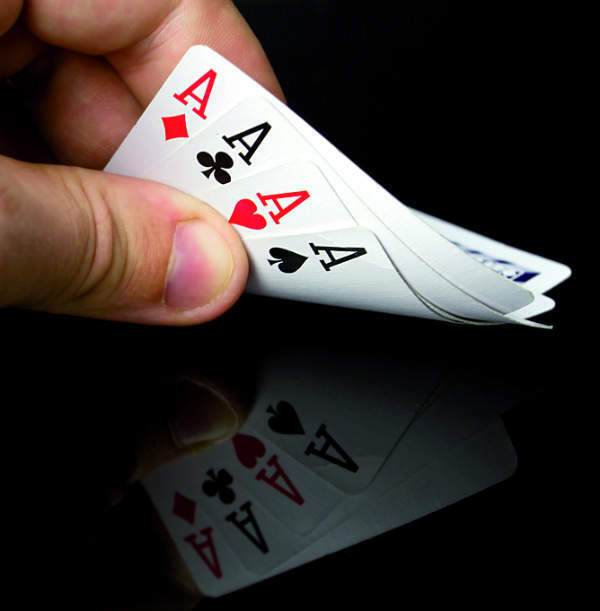 It wouldn’t be surprising if – similar to Arison’s recent U-turn at Carnival – other cruise operators without a strategy in place make the leap in the coming months.